Last year I outlined the helpful features obtained by signing up for Read and Write for Google, a toolbar accessible in Chrome that brings to webpages and documents (particularly Google Docs) text to speech (always free) and text prediction, dictionary, and other features (via premium account or teacher subscription after 30 days). 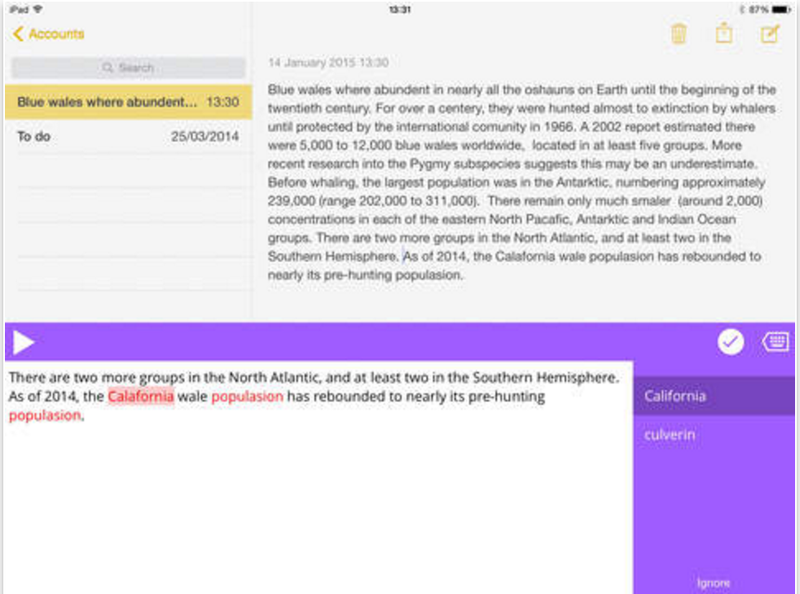 With Read and Write for iPad, these features become accessible...on iPad. After going through the steps to activate your account and then teacher account (see the link in the first sentence of this post), install the app Read and Write, which is essentially a keyboard. The app will bring you through the steps of activating the keyboard in your Settings app, and it will then be available for you to toggle and bring it up (installed keyboards are displayed if you tap the globe icon in your keyboard on iPad, or tap and hold to choose from all your available keyboards--I also like Keedogo). As with Read and Write for Google, the keyboard will be usable for all its features for 30 days; after that you will need to have signed up for a teacher account or purchased the features for students. Text to speech remains free "forever." Although iOS has text to speech built in through the "Speak Screen" accessibility feature, having the keyboard available will make the option of having text read aloud more visual and "at your fingertips." Read and Write was naturally designed for reading and language disabilities (and the developer touts benefits for English Language Learners as well), but text to speech is valuable for all students. The path to getting assistive technology accommodations in the hands of students that need it is not always clear, so it is helpful for as many educators as possible to know about available (and free) tools such as this! You can use the toolbar when doing web research, to automatically make any webpage a listening comprehension activity, or just to give students an engaging break from the dulcet tones of our yammering voices. Text to speech is also a huge help (even for me) when proofreading; students tend not to catch their mistakes when reading their own writing, and also often hate to proofread! 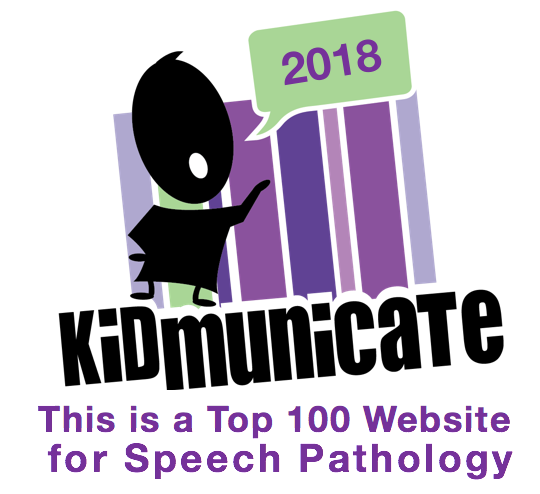 To learn more about emerging research on the benefits of text to speech technologies, see this helpful article. Texthelp's guide to using the keyboard is available at this link. A "sandbox" app is one that provides "open" play to some extent in a given context, Minecraft being a very popular sandbox application these days. Within a sandbox app, students can make choices and experience interactions with the context. Many great sandbox apps such as MarcoPolo Weather are relatively language-neutral, with little audio disrupting the activity, and for language intervention this presents a great context to elicit talk. Also notable in sandbox apps is the pace: you set it. In their post on sandboxes and play, Toca Boca notes that "Some sandbox games are set in vast city environments or large natural settings, others in more limited realms such as homes, doctors’ offices or hair salons." Tinybop has been publishing apps that have these "limited" realms designed around specific curriculum topics (often but not exclusively related to STEM- Science, Technology, Engineering, Math- areas). 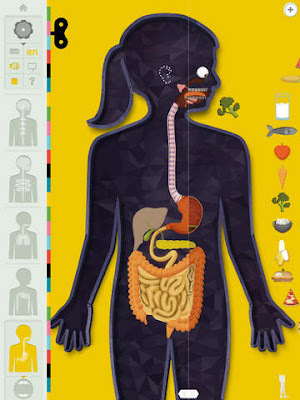 Take The Human Body ($3.99 and well worth it as a specialized digital toy), which is "a working model of the body." Students can be guided to explore each system of the body and interact with it to see how it works. For example, the nervous system section allows you to drag different stimulants to the body (such as a stinging bee or feather) to see the effects of touch or pain, and smartly connects to the camera and microphone of the iPad to demonstrate the senses of vision and hearing. I have benefited greatly by downloading the free handbooks that go with the Tinybop apps, as without these you might not know where all the interactions are hidden. I recommend printing the Human Body handbook, as within the app you have to access the adult dashboard to see it, and it's nice to have it on paper to the side so you can play with all the systems. You can download the handbook for this and other apps from Tinybop's website to make it easier to print. -linking to real-world narrative, perhaps by taking photos and creating a book on our relationship with our body systems in Book Creator. I'll be taking a look at the other Tinybop apps in a future post or two! Some technology tools that can provide an engaging model of conversational "moves" and skills have disappeared of late. The web tool xtranormal, which allowed you to type out dialogues that onscreen characters would speak, was wonderful for this, but is disappeared and is only reemerging as a complicated-looking software for Windows only. Likewise, Go Animate! was once school-friendly but has ported to a befuddling business-targeting subscription model. Toontastic of course is an excellent resource for making animations of social interactions, but an extra person or an affinity for making different voices really helps. -create (tap the Create tab, then characters) a base set of characters. I'd avoid the randomize button as it results in some folks with hair and clothing combos that would be a bit too distracting for your students- just tap the arrow and you'll be able to adjust face shape, skin color, accessories and such, and save and name your character. Note that all elements in the "script" interface on the left are editable. For example, tap the word "neutral" and you'll be able to give your character a different reaction or expression. It took me a bit to figure out that to delete a line of dialogue, you need to tap and sweep it to the left. Once complete, you can view your movie as a preview by hitting the play button or viewing it full screen. Any work you do is saved in your account as a "draft," but you can finalize your creation by tapping Publish and Share and saving it to the Plotagon website. There is currently no way to download the video to your Photos app (so don't use students' real names in videos that are saved to the website), but once "published," you can share to others as a link. I created plot videos (see links above in the scale) to serve as examples- endlessly amusing to my students- and we discussed how they corresponded with the scale and character perspectives. We then worked to create other examples, particularly of 2s and 1s. -Plotagon can serve as a context to model other strategies such as Story Grammar Marker's® 6 Second Story and Social Thinking's "Wondering Question" and "Add-A-Thought" expected behaviors in conversation. -The app can also be used in conjunction with the Superflex® Curriculum by Social Thinking to model examples of Unthinkable and Thinkable moments. -For students with more significant challenges, the app can be used to create and model scripts for various situations. -Plotagon is also just a fun way to practice writing or create projects related to curriculum topics.